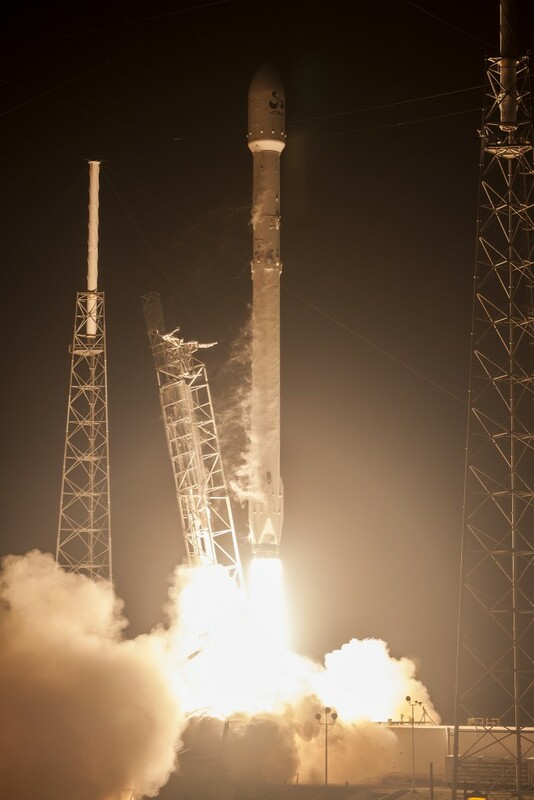 CAPE CANAVERAL, Fla. — Residents along Florida’s Space Coast hoping to get a sound night’s sleep were disappointed in the wee hours of Friday, May 6, as a SpaceX Falcon 9 Full Thrust rocket turned the dark of night into day with its nine Merlin 1D engines lighting up the skies. SpaceX’s 24th mission got underway at the opening of a two-hour launch window at 1:21 a.m. EDT (05:21 GMT) – racking up another win for the company’s efforts to reuse portions of their rockets. The payload for this mission, the JCSAT-14 telecommunications satellite, was constructed by Space Systems Loral and launched from Cape Canaveral Air Force Station’s Space Launch Complex 40. It marked the fourth time this year that SpaceX has launched one of its highly successful Falcon 9 rockets – both from Cape Canaveral in Florida and Vandenberg Air Force Base in California. The flight had been scheduled to launch at 1:21 a.m. EDT on Thursday, May 5. However, rough weather, in the form of thunderstorms, prevented normal launch operations from getting underway and forcing a 24-hour delay. That weather had blown itself out today by the time the countdown clock had reached zero. Forecasters predicted a 90 percent chance of favorable conditions for launch – Florida’s skies delivered. All of the other milestones for flight, including the May 1 Static Test Fire, had been successfully completed and the Hawthorne, California-based company was set to send the satellite to a geostationary Transfer Orbit (GTO) on behalf of SKY Perfect JSAT Corporation. SpaceX had worked to recover the rocket’s first stage by having it land on the “Of Course I Still Love You” Autonomous Spaceport Drone Ship (ASDS) positioned off the Florida coast. Those efforts paid off big time this morning. SpaceX and other organizations downplayed the chances of a successful landing for the JCSAT-14 mission with both the 45th Space Wing and SpaceX stating: Given this mission’s GTO destination, the first-stage will be subject to extreme velocities and re-entry heating, making a successful landing unlikely. The mission’s payload, the JCSAT-14 telecommunications satellite, was constructed by Space Systems Loral and will now begin its planned 15-year long tour of duty. In June of 2012, Space Systems / Loral announced that it had been awarded the contract to produce the JCSAT-14 communications satellite. This was followed about two years later with the announcement that SpaceX had won the contract to provide launch services for the satellite. Once it has been placed in its geostationary orbit, it will reside at 154 degrees east longitude and is being fielded to replace JCSAT-2A (JCSat 8). According to a post on Gunter’s Space Page, the JCSAT-14 satellite will help to provide the region’s growing demands for telecommunications services. JCSAT-14 is equipped with 26 C-band transponders and 18 Ku-band transponders. It will use these to provide telecommunications services across Asia, Oceania, the Pacific Islands, and Russia. Broadcast and data networks will rely on the services provided by the C-band transponders, with the satellite’s Ku-band beams granting high-speed connectivity for sea, air, and other purposes. Approximately 38 minutes prior to T–0 the launch conductor carried out a launch readiness poll, this was followed three minutes later by the loading of the rocket’s RP-1 (a refined version of kerosene) and liquid oxygen fuel. Ten minutes before liftoff, the rocket underwent engine chill down and eight minutes after that the U.S. Air Force Range Safety Officer gave the go-ahead for the mission to get underway. Thirty seconds later, SpaceX’s launch director also verified that the Falcon 9 was “go” for launch. At one minute before liftoff, two things happened at roughly the same time: the propellant tanks were pressurized and the Falcon 9’s command flight computer began final prelaunch checks. Three seconds before T–0, the engine controller ordered the engine ignition sequence to begin. Once the launch window had opened, the rocket promptly began thundering skyward, cutting an orange swath across the early morning sky. Approximately one minute and twenty seconds into the flight, the Falcon 9, with its precious cargo bolted firmly to the top of the rocket’s second stage, entered into the region of the atmosphere known as maximum dynamic pressure – more commonly referred to as “max-Q”. 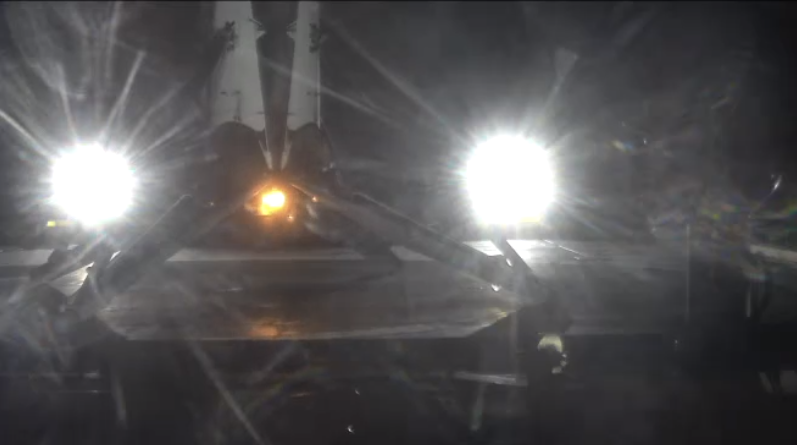 At two minutes and 38 seconds into the flight, the Falcon 9’s engine shutdown/main-engine-cutoff (MECO) took place, stage separation took place three seconds later. The first stage’s lone Merlin vacuum engine ignited at two minutes and 49 seconds elapsed time. The rocket’s payload fairing, its job complete, was jettisoned some three minutes and 36 seconds after the rocket had left the pad. SECO-1, the first of two second-stage cutoffs took place at eight minutes and 35 minutes into the flight. The engine re-ignited twenty-six minutes and twenty-seven seconds in. One second shy of a minute later and the second burn was completed. According to SpaceX, the JCSAT-14 satellite was deployed at 32:02 mission elapsed time. “Congratulations to SpaceX and the entire professional team here on the Space Coast whose tireless efforts shook the earth and turned the night into day,” he said. “Assured access to space is a challenging endeavor and today’s launch once again clearly demonstrates the collaborative efforts required for mission success. It’s an honor to work alongside the entire Space Coast team as we shape the future of America’s launch and range operations, and continue to be the ‘World’s Premier Gateway to Space,’” said Col. Shawn Fairhurst, 45th SW vice commander, who served as the Launch Decision Authority for tonight’s mission. Given the extra thrust used for the landing, and the greater re-entry heating, it will be interesting to hear if there are any significant differences in the condition of this core compared to the one from the previous landing. It will be quite interesting. Even if this stage isn’t able to be re-flown, SpaceX will still gain very valuable data which it can use to improve future vehicles. SpaceX is using an incremental design approach where “failure is an option” for the landing attempts. In the past, I’ve also heard this called the build a little, test a little, fly a little approach. This is turning out to be a very cost effective way for SpaceX to gain valuable flight data. Post flight inspections simply are not possible if your stage sinks to the bottom of the Atlantic Ocean. My guess is that re-entry damage couldn’t have been very bad or it would not have achieved a successful landing. They may just want to keep the stage for study purposes, but I bet they could re-fly it if they wanted. By the way, “failure is an option” can be quite an effective design approach. I’m thinking of Thomas Edison and the electric light bulb. What happens to the F9 2nd stage after it inserts JCSAT into GTO? Isn’t it in GTO also? I think they push it even higher into a so called “Graveyard Orbit”. Yes, the satellite will insert itself into its geo orbit, while the 2nd stage remains in the gto orbit which swings low and catches drag from the atmosphere. After a few months the orbit will decay and enter the atmosphere. How do they make sure where and when it actually burns up so no debree can hit any populated areas? They can’t make sure, it is uncontrolled at point. But from a probability analysis, the stage is very unlikely to A) come down in large enough pieces to hurt anyone and B) even if it does, it will most likely hit the ocean. This is the same math that all launch providers do for GTO stages after burnout. You’d think they could leave the second stage in a more permanent orbit for possible re-use in the future. The engine is still a valuable item. Smarter people them me will have a good reason why not. Hi Bruce. SpaceX decided to progress FH reusability of all stages rather than for F9. Heavy military and commercial geo sats are the most profitable particularly if you can reuse your entire launch vehicle. I believe they’re currently working on fairing reuse. The effort and cost to reclaim the rocket is greater than the value. Successfully transferring volatile fluids (fuel and liquid oxygen/LOX) in the vacuum/harsh environment of space presents great challenge. Better to use other types of fuel or other propulsion means once in space. Thanks for the information guys. I’m very excited for the future of space flight. Congrats to Mr. Musk and everyone involved, two consecutive successful sea landings, day and night, means it is realistic to envision this becoming routine in near future. This entire program is on level of achievement that would brook for Nobel nomination, if they gave Nobel for such!!! Glad to be witness to these, game changing events, thank you Mr. Musk!